It’s easy to be in love with a brand when everything’s going well. When, for example, everything you order online is in stock, delivered on time, and arrives in impeccable condition. Naturally, if this is your relationship with a company, they’re going to keep getting your business. They’ve met your expectations and are reliable on each subsequent visit. But then one day a package doesn’t arrive. The inevitable customer service exchange over your missing package becomes that brand’s moment of truth. Your loyalty now has a little chip in it. So what is the best response? Does the brand simply need to deliver the package, or do they need to do something more? It turns out, according to a study by The Corporate Executive Board (CEB), that focusing on delighting the customer during customer service interactions doesn’t pay in the long-term. While conventional wisdom might suggest that customers need to be won back by an over-the-top response, the truth is that loyalty is driven by how well a company delivers on its basic promises, as well as how it resolves the day-to-day problems that inevitably crop up over the course of each customer relationship. To determine this, the CEB surveyed 125,000+ customers, 5,000+ customer service representatives, and 100+ companies. As it turns out, delightful moments only occur about 16 percent of the time and increase operating costs by 10-20 percent. Simple math reveals that, from a business perspective, another tactic might be advisable. The chart above shows the relationship between loyalty and customer expectations. 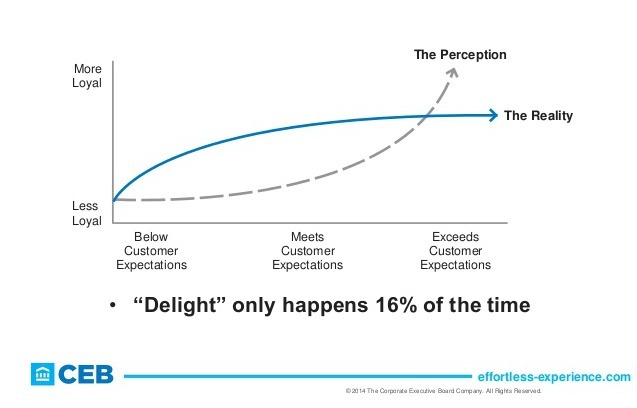 Perception shows that there is a strong positive correlation between exceeding customer expectations and growing loyalty, but the reality looks quite different. After a company gets past the point of “meets customer expectation,” loyalty growth slows and customers are not more loyal even if you put in the extra work. According to CEB research, any customer service interaction is four times more likely to drive disloyalty than loyalty. This might sound counterintuitive at first, but actually makes a lot of sense. Because customers generally initiate contact with support because they’re experiencing a problem, they’re automatically more likely to be disloyal to the product or company. At this point, Delisi stressed, the main focus of a customer representative should be to solve the problem as quickly as possible and return the customer to a state of neutrality. Findings also indicated that disloyal customers are more likely to spread disloyalty to other potential customers through negative word of mouth. For customer service professionals, the results of this study might be disheartening. Yet the findings are also valuable considerations when refining your company’s support strategy. The CEB’s data also revealed that there are specific ways that customer service can drive disloyalty. These drivers are mainly associated with the effort customers must put forth to get their problem resolved. For instance, having to contact the company more than once has a huge negative impact on customer loyalty. Delisi explained that companies often pride themselves on having a high first contact resolution (FCR) rate, but that single exchange often doesn’t resolve the customer’s issue. He recommended that customer service representatives start proactively suggesting ways to solve issues that the customer might encounter next. This little trick is called next issue avoidance and helps prevent customers from calling again and again, unnecessarily, further chipping away at their loyalty. All of this is actually good news. By looking at customer service from another angle and questioning long-held beliefs, The Effortless Experience reveals that companies might do better to factor delight into their basic promise and value proposition—for example, the always lightning-fast package delivery—and, in the event a package goes missing, for customer service to simply devote their effort into righting the wrong—nothing more, nothing less. Do you need a customer service BPO?